Hildryn is the second Warframe obtainable from Fortuna and Orb Vallis and the first one that needs a high standing with the Vox Solaris Syndicate. If you want to know more about farming standing and reaching the highest rank, you might want to take a look at our Vox Solaris Standing Guide. Hildryn is also the first Warframe that doesn’t use energy at all – instead she uses her shields to activate her abilities. Hildryn also has a very unique look and feels bulky, but not slow or clumsy at all. Instead she is truly a warrior with good mobility and great combat feeling. She does come with her own Warframe weapon and some offensive area-of-effect abilities that can quickly clear the map. We managed to find some builds that might interest you, so keep on reading! There are some discussions to have about the right aura mod and picking the right version highly depends on your own preferences and play style. Since Hildryn does have a very low health pool, picking Rejuvenation is very strong and will help you against status procs like toxic or slash damage. Yes, as long as Hildryn has overshields her health pool is save from those, but you’re not going to have overshields forever – especially in missions with a lot of status damage enemies. Pistol Amp is very nice if you use a build focused on your ‘Balefire’ ability, but is really but if you want to switch over to another build. Energy Siphon is useless, Steel Charge isn’t very useful for Hildryn and with that said, Corrosive Projection is probably the safest choice. It seems that there is also some confusion about the bonus section of the Augur Set: Hildryn technically doesn’t spend energy, so there is no bonus added to her shields when you use Augur mods in your builds! Tip: If you want to know more about Hildryn and her abilities, feel free to take a look at the wikia page. The ‘Balefire Charger’ is Hildryn’s Exalted Weapon and can be activated by using her first ability. It does come with innate electricity damage and has a very high base damage. It does however have a very low critical chance, so using Primed Target Cracker or Primed Pistol Gambit – which are an auto-include in a lot of secondary weapons – isn’t worth it. Instead we focus on raising the raw damage even further with Augur Pact and Hornet strike and use some elemental mods to deal a huge amount of damage. You can always pick the elemental combination you like most, raise the innate electricity damage further or switch mods out depending on your next mission. Gunslinger and Anemic Agility are great additions, since they will reduce the charge time by a lot and therefor allow you to ‘spam’ more shots. The 15% damage reduction of Anemic Agility might seem like a lot, but the faster fire rate is really worth it. If you are looking for your own builds, don’t forget that you can’t increase your damage with mods that feature impact, slash or puncture damage – so Pummel and similar mods are useless! This is probably the strongest build you can have with Hildryn. It looks super simple and doesn’t really use her more ‘interesting’ skills, but you can just kill everything without any trouble. High level enemies, assassination targets, Shadow Stalkers and so on will die in a few shots. The Balefire Charger does count as a grenade launcher and will deal great area-of-effect-damage against enemies. You can’t hurt yourself or your team mates with it, so aiming directly at your feed and killing everything close to you can be very beneficial. Against groups of enemies, try to aim for the ground close to them rather than aiming for the enemies body. That way you will guaranteed deal splash damage and kill everything. To deal lots of damage this build stacks a lot of strength (aim for 300%+) and if you don’t have Umbral Intensify maxed, using the normal Intensify version is also fine. Redirection is an auto-include in every Hildryn build, Fleeting Expertise helps with the shield costs of every shot and Primed Vigor is just a beast on this Warframe. You can get the latter as a simple log-in reward every 200 days, so if you don’t have it yet – keep logging in. 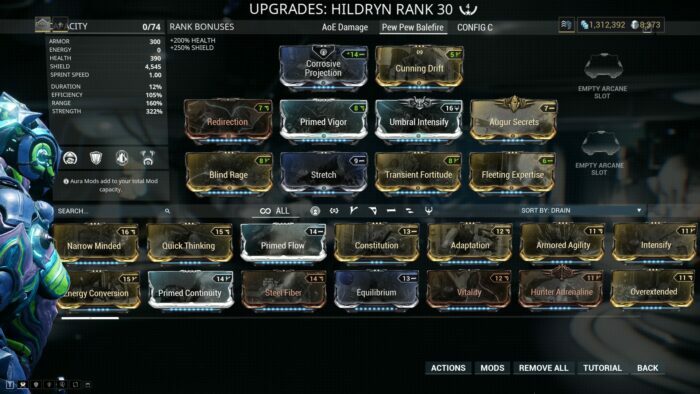 You could use the normal Vigor version, but the primed mod is super strong and not only helps out with the low health pool, but also raises Hildryn’s shields even further. Stretch and Cunning Drift are used to expand the explosion radius of your shots, but you can always change them if you rather have Power Drift, Streamline, more health (use Vitality!) or even Fast Deflection. Also, don’t forget that you can use Shield Pillage to restore your shields and get rid of status procs! This build utilizes Hildryn’s other abilities to kill large groups of enemies in no time. You combine your third ability ‘Haven’ with your fourth ability ‘Aegis Storm’ to disable your enemies and simultaneously deal huge AoE damage. You do want a good amount of range for that, so picking Cunning Drift, Augur Reach and Stretch is a good choice here. You might also want to try out Overextended, but the ability strength reduction is just too much of a cost in this build. The same is true for Blind Rage, because you’re already having some trouble with the energy drain (or rather shield drain). Fleeting Expertise and Primed Continuity help with the high shield drain (especially if you activate both abilities at once) and Redirection and Primed Vigor are again super great at expanding your shield and health pool. Umbral Intensify can as always just be a normal Intensify. Playing this build feels pretty cool and you can use your controls during Aegis Storm to fly around (Space and CTRL will change your altitude) while also killing stuff. Against a lot of enemies your shield will run out pretty fast, but you do have a few seconds of invulnerability if that happens, so let your shield recharge before you activate your abilities again. If you’re still having troubles you might want to add Fast Deflection to this build and run away while you’re letting your shield recharge. Hildryn is a very unique and very fun-to-play Warframe. She feels very strong, especially if you use her own weapon to kill of large groups of enemies. Getting her feels very grindy and sometimes boring, but she is worth the time invested. Despite her being super tanky (with the high amount of shields and all that) she can deal good damage and also flying around while killing stuff never felt this good. If we missed some builds or if you have ideas of your own, feel free to post them in the comments and share them with our community!